Millennials have a reputation for favoring borrowing over buying—they'd rather rent homes and lease cars than take on mortgages or car loans. Now, members of the borrower generation say they're straying from the largest likely lender: banks. A new national survey of 1,500 millennials found that the majority don't believe large financial institutions are designed to serve them and would rather borrow money from friends or family. 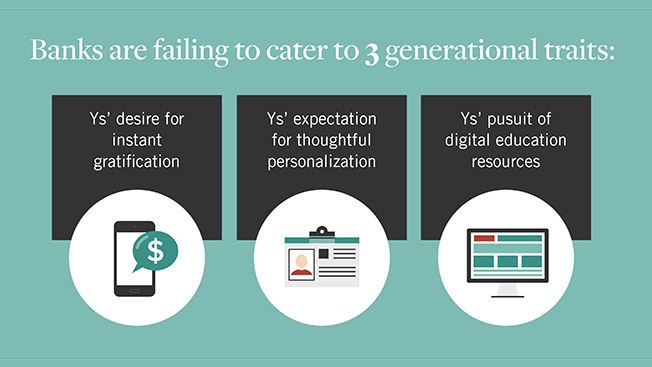 The Gen Y set doesn't believe banks are giving them the instant gratification via mobile options, digital-educational resources and personalization they desire. The survey is a part of the latest Cassandra Report, a quarterly research and insights study by Deep Focus. Joe Kessler, president of Cassandra Global, said banks should start thinking mobile-first and ready their game plans for a post-branch business model. "Banks are losing touch with an entire dominant generation," Kessler said. "The answer to combating mobile apps is for the banks to build better apps themselves. The real issue is that they haven't really invested the time and energy to truly understand their prospective millennial customer base."